Art of living conduct educative, spiritual, sessions worldwide. Art of living has done their significant work in the field of meditation and spirituality. Recently I got an opportunity to attend and Art living event here in Singapore. 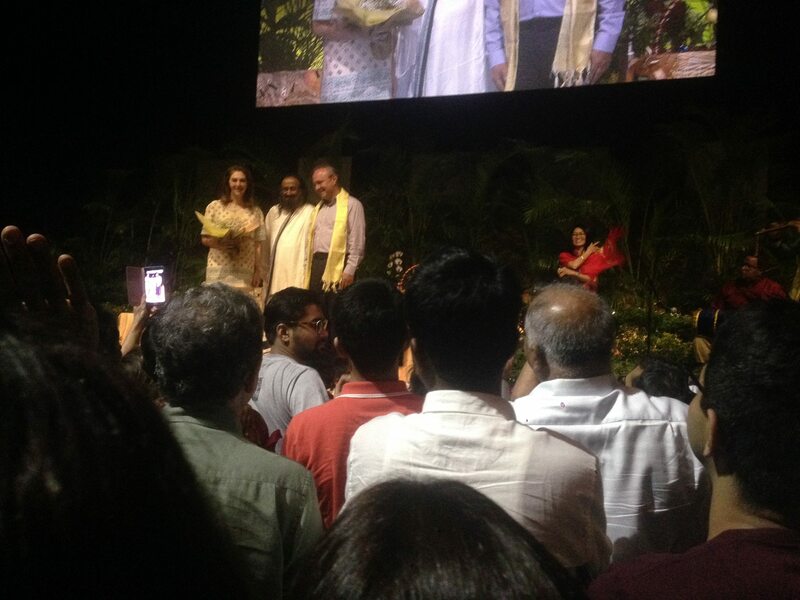 It was an event organized at Singapore- “An afternoon with Sri Sri Ravi Shankar”. I never got a chance to listen to honorable Sri Ravi Shankar (Humanitarian leader and spirituality teacher) before. So I was excited and curious to listen and know more about spirituality, meditation, inner peace and everything. When I reached the venue, it was fully crowded. But the noticeable fact was the silence at the place in spite of having such a huge crowd. People were waiting eagerly to listen to Sri Ravishankar. During session also it was pin drop silence in the auditorium. Meditation has outstanding benefits for health and it has to be done in proper way. Art of living conducts a session on various meditation techniques. The session started with few breathing exercises and welcome to Sri sri Ravi Shankar. I ‘m trying to share some of the crucial points mentioned by Gurudev Sri Sri Ravi Shankar in the session here. Whenever you are in a problem keep this thing in your mind. – Like every lock comes with the key, every problem comes with its solution. By giving problems to you, Nature is testing your ability to find a solution. So when you have a problem don’t take tension and just concentrate on finding the solution. Knowledge is the solution to every problem in human’s life. Nature has measured and then given an appropriate tail to every animal. Every human has given problems only as per their capacity. More problems mean more eligible person problems come to life and so doe’s solution follow them. Don’t get carried away with problems. Happiness is created by one’s own mind. And it comes from inside. You can’t make anyone happy. Happiness is state of mind and it can be experienced with spirituality. When a person can sense of unknown inner strength he/she can feel happiness. It is a continual process and every individual on this earth should practice it daily. Meditation has outstanding benefits for body, mind and overall health. Meditation is the way to know your inner self, power, ability. There is number of techniques practiced for it. Pranayam (Breathing techniques) is one of them and helps for meditation. Every individual should practice Pranayams for better health and mind. Meditation improves concentration, memory, and art of living arranges many meditation programs for school going children. To start with try to meditate every day for few minutes at least. Every meditation session helps to expand mind and views so start it today itself. Always live in present moment. Do not curse; angry because of the things happened to you in the past as it’s over. Don’t waste your energy on thinking about the past events. Do not worry about the future as it’s yet to happen. Live in the present moment. Keep your mind free of worries. Worry is something which is neither here nor there. You are here(on earth) for a limited period of time.Enjoy this period and whatever is passed is the memory and whatever going to happen in future will also become a memory , what remains is the joy. So always be happy and joyful. Gurudev enlightened the subject with extremely beautiful thoughts about the subject. He said- Spirituality is uplifted by meditation which cleanses heart and mind. Spirituality helps individual to feel joy from inside, calmness, and unshakable peace of mind in any situation.It makes people strong from inside. You have created a wrapper around you with the own thoughts, perceptions. To break that wrapper it’s necessary to have inner stability. Spirituality is associated with innumerable things. Inner strength and peace of mind are related to spirituality. A brilliant mind and kind heart are a basis to spirituality. There is freedom within you. Keep your energy high. Depression, stress can be overcome by spirituality. Always keep in mind the fact that some natural power is with you. It always accompanies you in all thick and thins. So never be afraid of anything and don’t feel alone. It was all about the session. Though I was completely naïve about the topic I could relate to many of the points mentioned there. Less you know you are more curious about the topic and similar was my condition in the event as I hardly knew anything about the techniques. Learning and it was totally enthralling, enchanting and enticing experience for me to know so many new things. I have decided to attend more art of living sessions to learn more. Every-day I’m reading these points and trying to imbibe habit of meditating. Though it’s extremely hard to keep my mind calm and thought-less there is improvement definitely. Thank you, Gurudev Sri Sri Ravi Shankar for guiding and educating millions of people like me. This article has really gotten me excited now! Thank you so much! How To Save Your Kids From Dangerous Indoor Air Pollution?